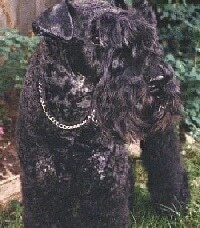 The Kerry Blue Terrier is a muscular, medium-sized dog. The head is long and in good proportion to the rest of the body. The skull is flat with a very slight stop. The nose is black with wide nostrils. The teeth meet in a scissors or level bite. The small eyes are dark. The V-shaped ears are small, carried forward with the top fold of the ear slightly above skull level. The ears are often taped when the dog is a puppy to conform the ears to the show standard. The neck is long, widening towards the shoulders. The high-set tail is straight, docked to medium length. Note: docking tails is illegal in most parts of Europe. The coat is soft, wavy and dense. Coat colors include black to very dark blue (darker than deep slate), shades or tinges of brown to different shades of blue gray. The correct mature color is from slate blue to light gray. The color should "clear" by the time the dogs are 18 months old. If the dog is solid black after the age of 18 months it is not allowed to be shown in AKC shows. Black or dark blue points on the head, muzzle, feet and tail are permissible at any age. Some adults never lighten properly. Adults may retain dark points even when the rest of the coat lightens. The Kerry Blue is animated, playful and comical. It has a reputation of making people laugh. Affectionate with the family, it likes to be with its owners. Alert, determined and rowdy, it enjoys roughhousing. The Kerry is a good watchdog, but will not attack unless it is really provoked. The Kerry is friendly, getting along with strangers and usually gets along with other pets when properly introduced and supervised. If the humans are not 100% pack leader and lack canine communication skills the Kerry can become dog aggressive. This breed is protective and should be extensively socialized, especially with other dogs, or he may be quite a handful. They rarely bark unnecessarily. Kerry Blues require a confident owner who has a natural air of authority, and need firm obedience training. These dogs are intelligent and can be taught to perform tricks. They have a very good memory. With meek owners they will become willful, testing the owner at every turn. Owners need to be consistent with the rules and more determined than the dog. They have an aptitude for sports such as catch and agility training, but make sure the dog enjoys the challenge. If their lessons are too routine for the Kerry Blue, they will lose interest. This is usually a very healthy long-lived breed. Although, some are prone to Hip Dysplasia, PNA, cerebellar abiotrophy. Also some minor concerns are cataracts, spiculosis, hair follicle tumors, entropion, KCS, narrow palpebral fissure distichiasisme and CHD. Retinal folds occasionally seen. The Kerry Blue is a sporty dog which needs to be taken out on a daily walk, jog or run where he is made to heel decide or behind the human holding the lead. In a dog’s mind the leader goes first. If you allow it to walk ahead, whether you realize it or not, you will be communicating to the dog that he is YOUR leader. This can cause the Kerry to become willful as he thinks he needs to tell YOU what to do rather than the other way around. Kerries should be groomed every 6 weeks. 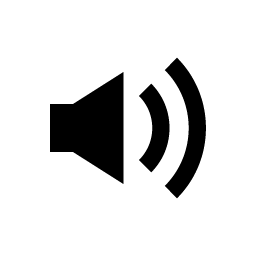 They also need to have the hair pulled out of the ear canal, as they are prone to ear infections when the ear hair gets too long and wax and dirt have built up. Pet Kerries can be trimmed like a Soft Coated Wheaten. In addition to this, they will need grooming once a week with brush and comb. Dogs for showing will require more extensive grooming. Frequent bathing will not dry out the skin as it does in so many other breeds. Bathing and combing every week is a must! It keeps them clean. Without proper care their beard will get smelly and packed with food and dirt. Kerry Blues are considered good for allergy sufferers. The Kerry Blue sheds little to no hair and is odorless, even when wet. 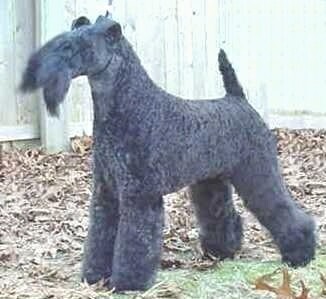 The Kerry Blue Terrier originated in the 1700s and is native of County Kerry, Ireland, from which the name "Kerry" derived, along with "Blue," for the color of the coat. The Kerry is the national terrier of Ireland, where it is known as the Irish Blue Terrier. 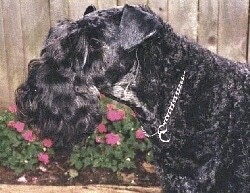 The Portuguese Water Dog is credited for contributing to the Kerry's single, silky, wavy coat. 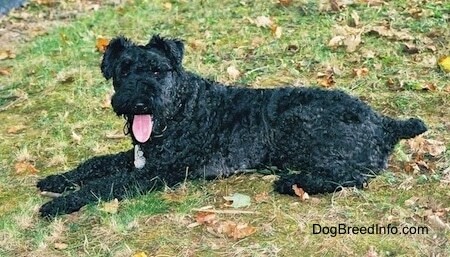 Others think the Kerry Blue Terrier was developed from the old black terriers, Spanish (or Russian) "Blue Dog," Soft Coated Wheaten Terrier and possibly Irish Wolfhounds and Irish Terriers. There is a writing on dogs in Ireland over a century ago that mentions a Harlequin Terrier that sounds like a breed description of the Kerry Blue. The Kerry Blue has been used as an all-round working and utility terrier as a small game hunter, retriever, farm dog herding sheep and cattle, house guardian, police work and a family companion. 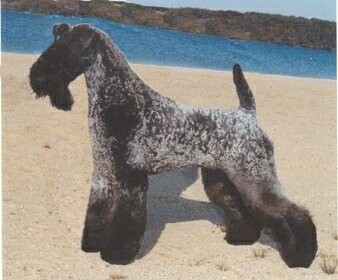 In 1922 the United States Kerry Blue Terrier Club was founded. The breed was recognized by the AKC in 1924. 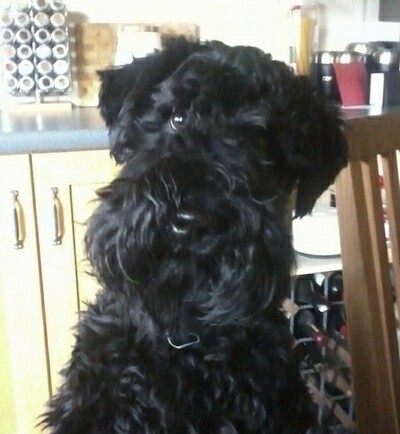 Diesel the 2-year-old Kerry Blue Terrier on Christmas Morning!